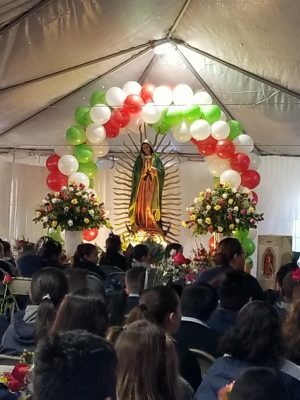 Mother of Sorrows celebrated The Feast of Our Lady of Guadalupe on Tuesday Dec. 12th in celebration of the first apparition of The Virgin Mary to Juan Diego a poor Aztec Indian. Before the start of the school day, students, teachers and parents were invited to a special outdoor mass with Father Bryan. Mass began with a Matachines Performance (South American-Indian dancers who perform ritual dances) and ended with all the students at Mother of Sorrows placing flowers at the feet of a beautiful statue of Our Lady of Guadalupe.